Some people have claimed Myers has done a lot to educate people about the Jewish faith. A picture of the column which has caused the controversy. MEMBERS OF THE Jewish community in Ireland have leapt to the defence of embattled columnist Kevin Myers whose Sunday Times column was labelled as “anti-Semitic and misogynistic”. In a statement released today, the Jewish Representative Council of Ireland said that Myers had “inadvertently stumbled into an anti-Semitic trope”. The opinion piece, which appeared in the Irish print edition yesterday, is critical of recent calls for equal pay for men and women in media organisations, after the BBC published its list of highest-paid stars and only one woman made the top 10. 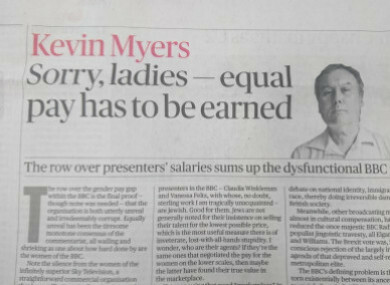 In the article, which is entitled “Sorry, ladies – equal pay has to be earned”, Irish journalist Myers argues that men may get paid more for a variety of reasons. Frank Fitzgibbon, editor of the Sunday Times in Ireland, released a statement apologising for the offence caused by the column. It also emerged that Myers would not be writing for that publication again. However, the Jewish Representative Council of Ireland’s statement has defended Myers. Its statement read: “More than any other Irish journalist, he has written columns about details of the Holocaust over the last three decades that would not otherwise have been known by a substantial Irish audience. “It is understandable that there is a strong response to, and rejection of, Kevin Myers’ article but it is wrong that misconceptions and misinformation be circulated about his previous writings. Kevin Myers inadvertently stumbled into an anti-Semitic trope. BBC presenter Vanessa Feltz has described the column as “horrifying racism”. Speaking on BBC Radio London, Feltz questioned how “something so blatantly racist” was allowed in the newspaper. “When someone alerted me to it… I couldn’t believe such a thing had been printed. It is absolutely gratuitous, not cleverly done, it’s blatant racism. When you see it like that it’s very horrifying,” she said. Email “Members of Irish Jewish community defend Kevin Myers after controversial column”. Feedback on “Members of Irish Jewish community defend Kevin Myers after controversial column”.